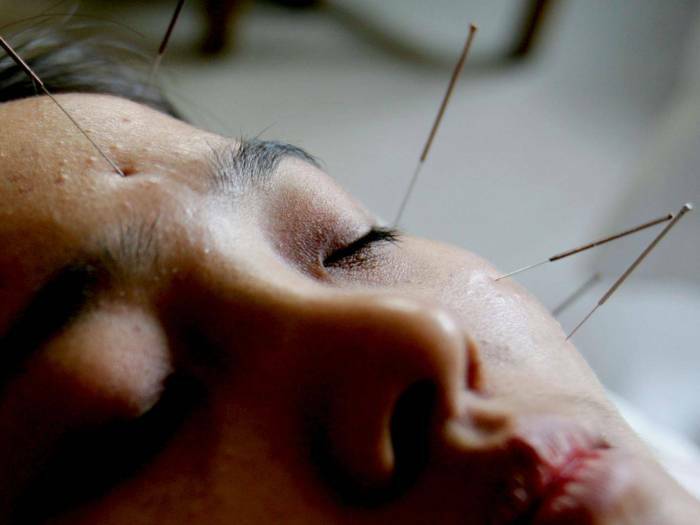 Acupuncture is no more useful than a placebo at improving chances of conceiving a child through in vitro fertilisation IVF despite the claims made by alternative medicine practitioners, a major clinical trial has found. The study involving hundreds of women across 16 IVF centres in Australia and New Zealand sought to rigorously test the findings of earlier research that reported a 65 per cent increase in conception and birth rates with IVF. It found no significant benefit from IVF when it compared a short course of acupuncture and sessions using dummy needles placed away from “true” acupuncture points. The authors said the benefits seen in previous studies had come when comparing those who had acupuncture with those who had not, was likely down to the placebo effect of relaxing sessions, during the often stressful process of fertility treatment. The researchers from Western Sydney University recruited 824 women aged 18 to 42 – average age of 35 – who were receiving IVF treatment. Dividing them into two groups, they performed real acupuncture on some of them and faked it on others. Each woman received a treatment around the time of ovarian stimulation and on the day of the embryo transfer, though acupuncture practitioners would call for patients to have more sessions. The researchers found "no significant difference in live birth rates", between both groups, who had it administered at the time of ovarian stimulation and embryo transfer. Publishing their findings in the Journal of the American Medical Association, the authors concluded that acupuncture should not be offered alongside traditional treatment to improve IVF births. There were 74 live births among the 405 women receiving acupuncture, compared to 72 births among the 404 women receiving the sham treatment – a birth rate of 18.3 per cent and 17.8 per cent respectively. While this was not statistically significant, the authors are working on a second paper to investigate the “psycho-social benefit” that appears to come from IVF. “Feeling relaxed and reporting relief from stress and women feeling good about themselves is to be welcomed for women as they undergo an IVF cycle,” said president of the Fertility Society of Australia and co-author of the paper, Professor Michael Chapman. Acupuncture comes from a branch of traditional Chinese medicines focused on inserting needles at key pressure points to realign "qi", supposed energy flows in the body. It is commonly used for chronic pain and other treatments without effective medical interventions. A typical session lasts up to an hour and can involve a prolonged discussion with the practitioner about the illness and underlying stress. Previously backers have said that as it is relatively cheap, costing around £50 to £70 for a single session and low risk, acupuncture could be a useful add on therapy if it helped improve birth rates with IVF – which costs thousands of pounds for a single cycle. The report comes after experts from the Royal College of Obstetricians and Gynaecologists criticised the cottage industry of non-evidence based add-on treatments that have sprung up around IVF. Professor Lesley Regan told a conference last month that women are being “bullied” into spending thousands on add-ons which clinics tell them will give the best chance of success.